Shipwreck Beach or Shipwrecks Beach is one of the largest expanses of beach along Keoneloa Bay (KAY-OH-NAY-LO-AH) in the Poipu area. The beach is named after an old wooden shipwreck that was partially buried in the sand above the waterline and slightly left of center on the beach. Those that remember seeing it in 1980 report it being over 100 feet long. Storms would uncover the top part of the hull for a while and then another high tide would later re-bury it. The ship hasn't been seen since 1982. It's unknown by this writer if it washed out during Hurricane Iwa (November 1982) or if it was quietly removed. Perhaps part of it is still there buried deep in the sand. For many years, Shipwreck was one of the best-hidden beaches on the island and access to it was by way of dirt sugarcane roads. Development in recent years around the beach has brought it more attention and made it easier to access. Strong currents during much of the year, make this beach somewhat dangerous and best suited for strong swimmers and advanced surfers and boogie boarders. Be sure to observe conditions and talk to locals before entering the ocean. Of course this is good advice on any of the beaches on Kauai. You can enjoy beach combing and sunbathing along its shore plus the Mahaulepu Heritage Trail begins at the north end of the beach and continues along the sea cliffs for several miles all the way to Kawailoa Bay. This is a fascinating hike over petrified sand dunes and other geological features. Several ancient cultural sites exist along the way and the trail offers great ocean and shoreline views. This is a great place to view Humpback Whales from November through March. The Cliff at Shipwreck Beach is a lithified sand dune and is 35 to 40 feet high (above the surface of the ocean), fluctuating somewhat with the tides. People frequently jump from it to the ocean below as did Harrison Ford and Anne Heche in the movie "6 Days and 7 Nights." Of course, we don't recommend jumping ... yada yada yada. Grand Hyatt Kauai Resort and Poipu Kai Resort both front Shipwreck Beach, where you'll find restaurants, shops and bars. The Hyatt has such extraordinary grounds and swimming pools that even if you aren't a guest, you'll want to stroll along the public walkway just to see it. To get there drive just past the Grand Hyatt on Poipu Road. Turn right just after the large parking lot onto Ainakoa Street and go past the tennis courts and to the end of the road where you'll find a public parking lot. If there isn't room in the parking lot, many people usually park on the dirt area above the lot. Public restrooms are available just off the parking area in front of the Grand Hyatt. 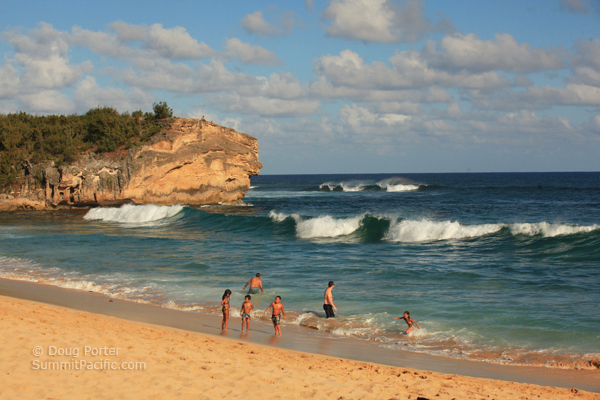 See our complete list of beautiful Kauai Beaches.